As much as I love cooking and trying new products, I don’t like spending hours in the kitchen. I am always looking for quick and convenient recipes! That’s why I am a huge fan of Stir-Fry recipes ! You chop veggies, add some meat, a delicious sauce and your dinner is ready in about 30 minutes! The secret of a delicious stir fry is the seasoning! When I was offered the opportunity to try the new Club House’s Flavourful Recipe Mixes, I was eager to put them to the test! Thanks to Mom Central Canada, I received 3 packets of each of the 6 Club House Flavourful Recipe Mixes as well as a month of mixes! As soon as I received this treasure package, I started looking for recipes and stir fry ones to prepare. On the back of each Club House Recipe mix, you will find a recipe. You can also visit Club House website for a list of additional recipes! Since I had beef in the fridge, I decided to prepare a Lemon Ginger Beef Stir-fry! 1 lb (500 g) boneless beef, cut into thin strips. I used less than a pound of beef cut into cubes! 1 pepper sliced. You can use green or red bell. 1 tbsp (15 mL) soy sauce. I used a sauce that is low in sodium! Heat oil in large skillet over med-hi heat. Add beef and stir-fry 3 minutes. I usually stir-fry until it is brown! Add seasoning and vegetables. Stir-fry until tender-crisp, 5-7 minutes. Stir together corn starch and soy sauce. Add to pan with water. Stir-fry 1-2 minutes or until sauce is thickened. I served over white rice. You can also serve over noodles. I have to share this with you! I don’t know about you but when I cook, kids are always around me in the kitchen! It’s hard to concentrate! When it was the time to add the seasoning, I put ALL the mix in the beef stir fry! But the trick is that the mix is a ginger one. Ginger = Spicy!! And yes!! The recipe was a bit spicy for my little ones! But when I mixed it with the rice, it was perfect for them. My husband and I love spicy recipes and we just loved it!! Final thoughts: This beef stir-fry is a delicious, delectable recipe! The Club House Flavourful mix is a huge addition! 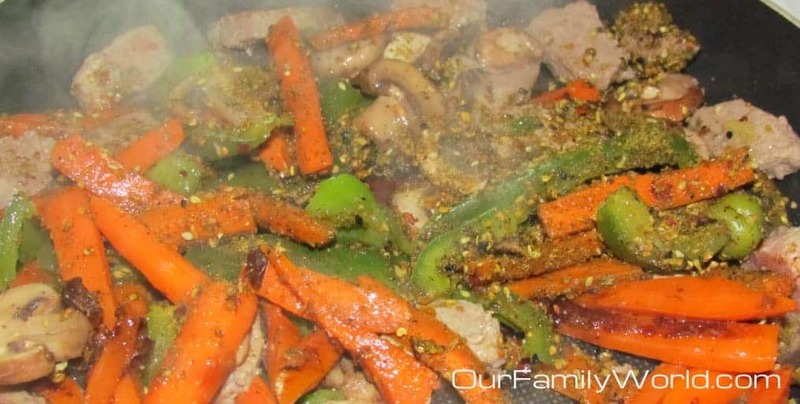 It adds spice and such delectable flavor to the beef and veggies! 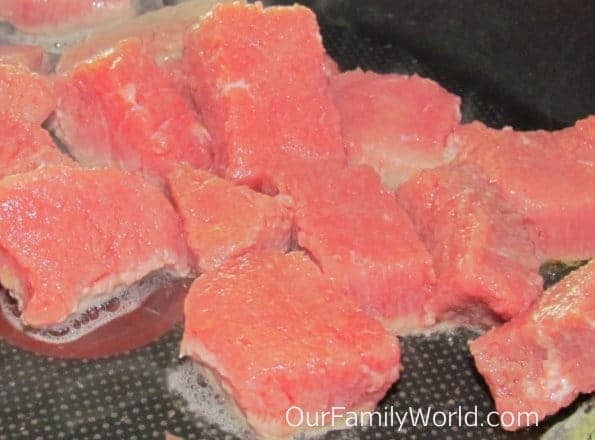 This beef stir-fry is so easy to make that I prepared it again! This time, I used half of the mix and the kids enjoyed every bit! Thanksgiving Contest: Club House is starting the Thanksgiving season off with an online contest. You can enter to win $1 000! Check Club House.ca in the coming weeks for details. Readers’s Giveaway: One Canadian reader will win a $50 Gift card as well as Club House Prize Pack. 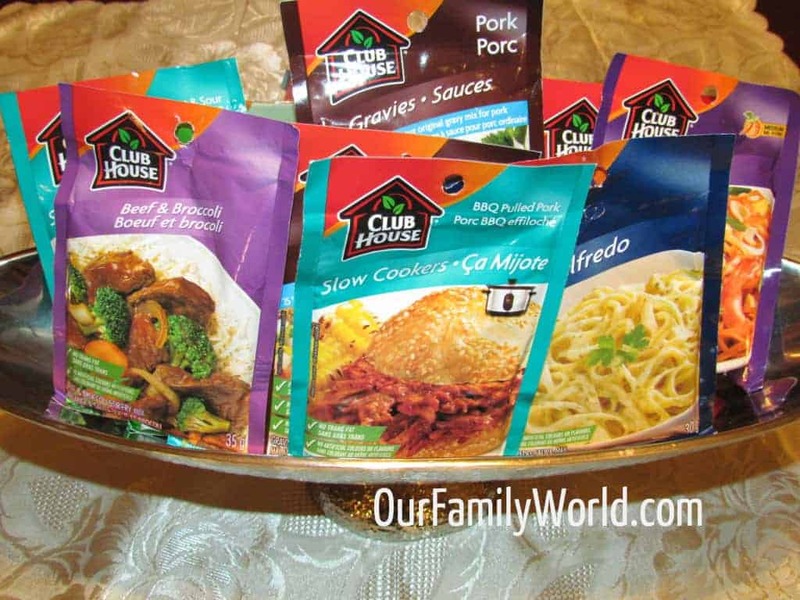 Disclosure – I am participating in the Club House Flavourful Recipe Mixes Blog Tour by Mom Central Canada on behalf of McCormick. I received compensation as a thank you for participating and for sharing my honest opinion. I’ve used the Clubhouse Italiano Seasoning for years. I’d love to try the Butter Chicken. I have started using Club House Slow Cooker recipes. They are all just so easy. I put all ingredients in when I get home from a day out. I cook it for the recommended time. I then use this for the following night for a ready made dinner. My favourite recipe mix is Flavourful Tuscan Chicken Recipe Mix. Herbes de Provence. I love roast chicken. I love all their marinades. We like the mesquite one on chicken for the BBQ. Make chicken way more interesting. I would make the pulled pork sandwiches they look great. I don’t really have a favourite yet, but I would like to try the Flavourful Creamy Parmesan Chicken Penne recipe mix. I would love to make Canadian Chili. I like the Flavourful Tuscan Chicken Recipe Mix and would like to try the Tuscan Chicken Stew. I would like to try the Beef and Broccoli Stir Fry. I love the Tuscan Chicken Recipe Mix! I like the Flavourful Creamy Parmesan Chicken Penne Mix. I havent tried any of them but would love to try the Flavourful Hickory BBQ Ribs Recipe Mix..hmm.. I would make ribs of course! I would try the Lemon Ginger Beef Stir-Fry – it looks very good! I definately love using their mixes to make stir fry’s they are just so much yummier! I also like their gravy mixes! 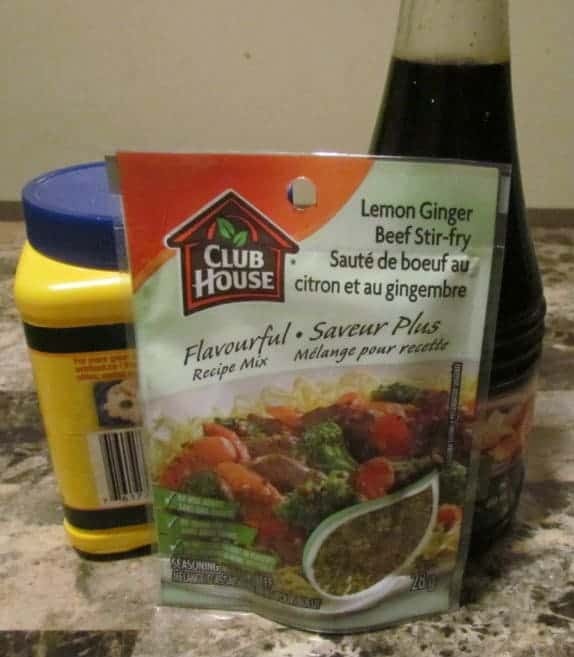 My favourite is the Flavourful Lemon Ginger Beef Stir-fry Recipe Mix! If I won, I’d grill some steaks with the La Grille Blazin Pepper Bourbon. I would do the butter chicken. I like the hickory bbq ribs and I’m itching to try that! 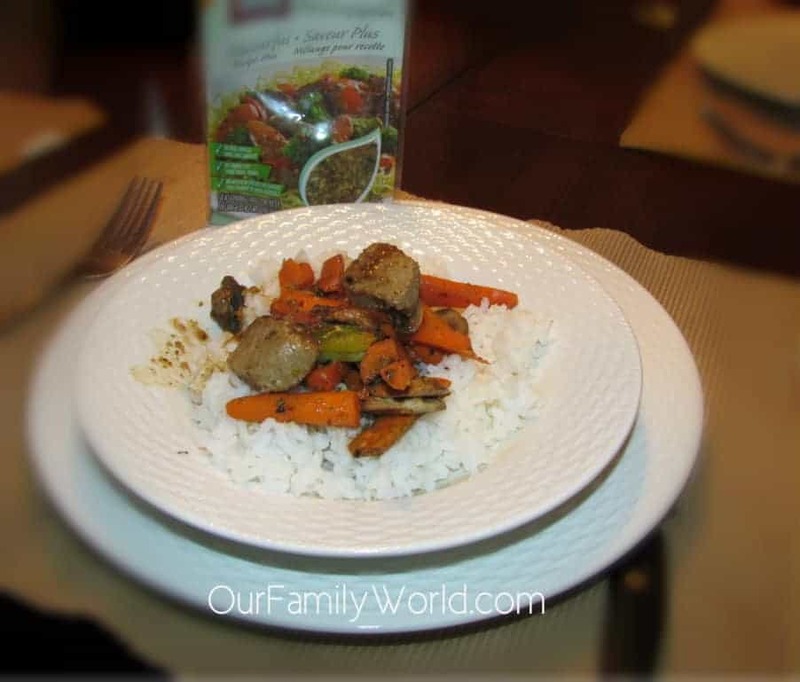 I would make the Lemon Ginger Sweet Potato Vegetable Bake with the Lemon Ginger Beef Stir-Fry Recipe Mix. I like the Flavourful Hickory BBQ Ribs Recipe Mix. I’d love to make that for the family. I like the Creamy Parmesan Chicken Penne and I would also like to try the BBQ pulled pork recipe. The Beef and broccoli would be my favorite. Flavourful Herbes de Provence Roasted Chicken looks good. I’d use it to make a nice chicken dinner! I’d like to try the Flavourful Creamy Parmesan Chicken Penne and make Parmesan Bruschetta:) Thanks for the giveaway!